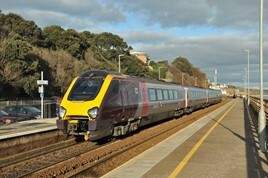 Four years after storms closed the Exeter to Plymouth railway at Dawlish, the Peninsula Rail Task Force (PRTF) says the Government is “gambling with the region’s economy”, with no permanent solution to the resilience of the railway yet funded. PRTF Chairman Geoff Brown says the Government has yet to respond to the task force’s Closing the Gap 20-year plan for investment in the region’s rail network - 14 months after it was published and submitted in November 2016. “Network Rail has warned that there will be an increase in disruption and closures, rising by more than 600% to once in every four years by 2065, if nothing is done to the line. We can’t allow the Government to continue to gamble with our economy,” said Brown. He added: “The Government has spent £35 million on essential repairs reinstating the sea wall. Another £15m has been committed to the development work at Dawlish to date, but these funds are not enough to take work beyond the option development stage." And that is why a brand new railway line near Dawlish that will divert trains away from the sea at Dawlish. With a brand new railway station to be built to serve the popular Devon seaside town as the current railway station next to the sea would be closed and completely demolished. With the so called former railway line to be made into a public footpath along the sea wall and peninsula. Probably whatever work is done to strengthen the line and the defences at Dawlish, the line there will always be at risk to storms. The new Exeter to Newton Abbot main route needs to be built so that when there's storm risk or damage at Dawlish, disruption to main line services due to closures (or diversions) can be avoided.